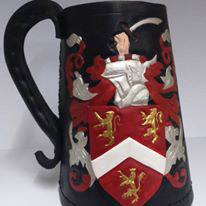 The history of leather drinking vessels stretches from ancient times to the time of the Crimean war and is a very British history. Moulded leather vessels may date back to early Egyptian times when some pottery forms followed the shape and style of skin bags. A relief on the Rekhmire Tomb clearly resembles a leather bottle. An early Nubian pre-dynastic grave has revealed a leather vessel at the head of the occupant where a pottery one would normally be expected. Pan graves of 1600 BC att Mostagedda contain solid forms of the shape of clay pots which may represent cores for shaping such leather vessels. Moving to western Europe, Neolithic leather beakers and a small bowl were found in Schleswig, Switzerland and a Neolithic beaker was found at West Smithfield, London, made of tanned cowhide with some hair still attached, Neolithic pottery suggests an origin in leather bowls with bag like shapes and seams being reproduced. Britain has been the home of leather vessels for longer and in higher numbers than anywhere else in history and their existence has become quintessentially British. The bouget was a pair of waterproof leather bags joined by the kneck and may correctly be referred to as a drinking vessel. 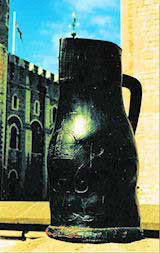 Introduced in to England during the Crusades, it was the fore-runner of the hard bodied leather water bottle. The Black Jack`s name is derived from the materials used in its construction. Leather that has been soaked in hot water and dried is known as Jack leather. The same source can be attributed to the name for German Jackboots and Medieval Arming Jacks. This is also the origin of the modern word “jacket“. Jacks were originally black because the black material used to line the inside, was used on the outside of the vessel thus colouring it. For a description of the materials we use, see Factsheet Page. “mistery of botellars had been well and in order made from the time whereof memory does not run the contrary”. 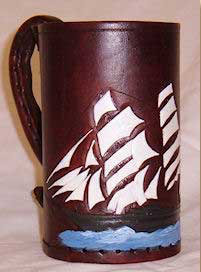 “should put his mark on the vessels he made that they might be identified”. Botellars also made pots. This shows that the word “pottery” is derived from the craft of leather working and not from those who are now known as potters. “Pot” comes from the term “potable water” being liquid which pots carry. Laws were passed by various Monarchs from Edward II to Elizabeth I which placed high export tarrifs on leather. 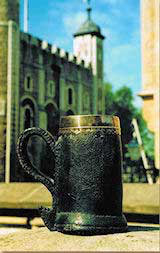 This resulted in a drastic reduction in price in England and so made it the material of choice for drinking vessels. Leather was also the material of choice for the transportation of liquids around the country because its light weight compared well with that of the alternative, earthenware. Leather workers of all types were understandably happy with lower prices resulting in the popular ballad of the time “The Shoe-Makers Delight”. However, not all were pleased because in the reign of Charles II export taxes had a disastrous effect on associated cattle rearing and land prices. 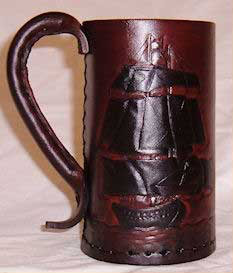 The duties were eventually revised, thus raising leather prices and reducing its use for such as drinking vessels. It seems that such distortion of the markets is no new thing. 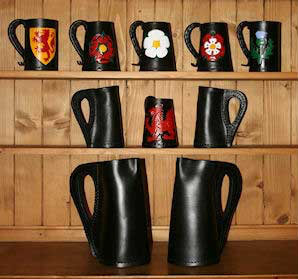 The history of the leather bottle, black jack and tankards continued through various fashion changes, including the widening of the base for stability in Tudor times, as shown by those found with the wreck of the Mary Rose, so we are left with a multitude of shapes to represent the various periods. Tankards and Jacks took their place in the literature of the day as found in the adventures of Mr Pickwick at the Leather Bottle in Cobham. It is fit that inns were named after leather vessels because they did attract an air of convivial association as shown in the old drinking song “The leather Bottle”. Black Jacks and bombards were unknown in France. A French courtier returning to his country from the court of Charles II, reported that the English drank from their boots. This phrase was revived during the Battle Trafalgar when English sailors were ridiculed for the same thing. In the village of Hallaton, Northamptonshire, the sport of bottle kicking was very popular. More recently made of wood, the bottle was originally made of leather making one wonder if this was the origin of the leather football. In the Black Country during the early steel industry, the Black Jack was known as a Piggin. With a whistle attached to the handle it was used by thirsty steel workers to summon the water boy, hence the name Piggin Whistle which became a popular pub name, The Pig and Whistle. In the Yorkshire mining town of Barnsley the same Jacks had bells attached to the handle for similar use and were known as Jingle Boys. During Elizabethan times, even wealthy merchant families would possess just one wine glass because of the high cost of Venetian glass. Placed in the middle of the table and used communally, it would be refilled by a man stood in the corner with a leather bottle and known as the botellar or, in modern terms, the butler. Leather drinking vessels are closely associated with the social history of the country and their use continues to the present day.